Jib cranes (also called Workstation Cranes) can be selected from our standard range of capacities and reaches, or can be manufactured inhouse to suit your specific requirements. Our jib cranes are available up to a lifting capacity of 5000kg, and a slewing radius of up to 8 metres. 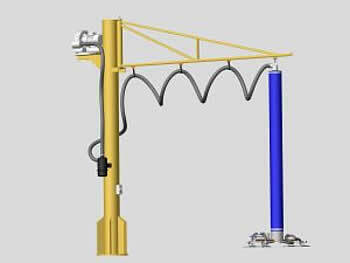 Millsom Jib cranes come in a combination of two main arm configurations, and two main support configurations.